I have made these enchiladas several times now. They are so tasty and very filling. You can just use salsa for your sauce if you are short on time but I highly recommend the homemade sauce. Spray two 9 x 13-inch baking pans with coking spray and set aside. To prepare sauce, heat oil in a large pot over medium heat. Add onions and garlic. Cook and stir until onions are softened, about 5 minutes. Add remaining sauce ingredients, except cilantro. Bring to a boil. Reduce heat to low. Cover and simmer for 15 minutes, stirring occasionally. Remove from heat and stir in cilantro. Taste and add a bit of salt, if needed. While sauce is simmering, prepare enchilada filling. Heat oil in a large pot over medium heat. 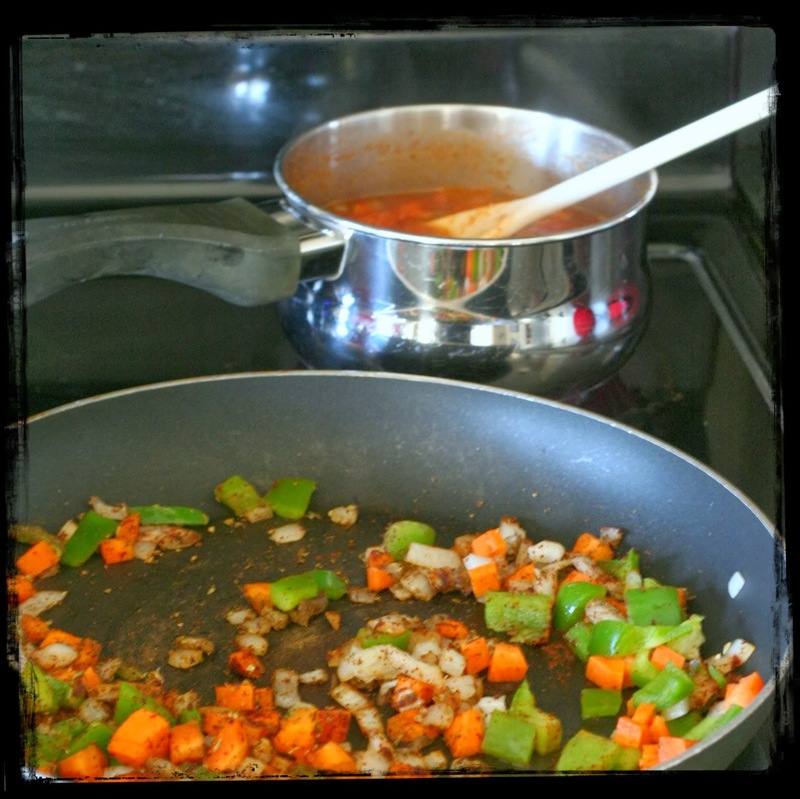 Add onions, carrots, green pepper and garlic. Cook and stir until vegetables are softened, about 5 minutes. Add jalapeño pepper, chili powder, oregano and cumin. Cook for 1 more minute. Remove from heat. Stir in beans, corn, lime juice and cilantro. Mix well. To assemble enchiladas, spread 3 heaping tbsp filling down centre of one tortilla. Sprinkle with 1 heaping tbsp cheddar cheese. Fold tortilla to enclose filling and place seam-side down in baking dish. Repeat with remaining tortillas, leaving yourself with about 1/2 cup shredded cheddar. Pour prepared sauce evenly over enchiladas, making sure each one is coated. Cover with aluminum foil and bake at 350F for 25 minutes. Uncover, sprinkle with remaining cheese and return to oven (uncovered) for 5 more minutes. Serve enchiladas with a dollop of sour cream on top. I added rice to the enchiladas this time since I have some leftover in my fridge. I also just have frozen cubes of cilantro and use that, they come in very handy. This is also a recipe I have made several times. It is actually pretty easy to make and not too messy. I used haddock instead of cod. I have never tried tartar sauce and I absolutely love the recipe they have here and I don't think I could eat fish without it now. To make tartar sauce, combine all sauce ingredients in a small bowl. Refrigerate until ready to use. In a shallow bowl, combine bread crumbs, Parmesan cheese, parsley, thyme, paprika, salt and pepper. Lightly beat eggs in another shallow bowl. Spray a baking sheet with cooking spray and set aside. Rinse fish and pat dry with paper towels. Cut fish into thick strips. Working one at a time, dip pieces in egg, then in crumb mixture, coating both sides with crumbs. Place on baking sheet. Allow some space between pieces. Bake at 450F for 8 to 10 minutes, depending on thickness of fish. Fish is ready when it flakes easily with a fork. Serve with tartar sauce and lemon wedges, if desired. I chopped up some sweet potatoes (2-3) and tossed them with olive oil, pepper, paprika and whatever else I feel like that day. I cook them at 425F for 20-25 minutes on parchment, flipping halfway. When I make the mayo-curry dip, I just mix some mayo, curry powder and a bit of honey.